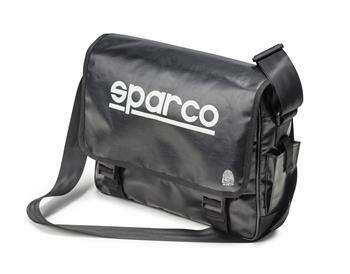 Sparco Sportswear - Bag - Galaxy UNIVERSAL - Dezod Motorsports Inc - Home of the automotive performance enthusiast since 2002. Flap-over laptop. 100% PVC fabric. Double buckle closure. Velcro closure front pocket and zipped rear pocket. Wide storage compartment with zipped pocket, mobile and pen holder. Lateral exterior mobile pocket. Adjustable shoulder strap. Water resistant material.